I am not a breakfast person. I would rather choose any other meal where I can drink wine. You are probably thinking I am stark raving mad, but to raise a glass of wine with a meal and to toast to life, happiness, health or whatever, is to me an appropriate way to dine. I do have to admit that sipping on a glass of wine over breakfast has for many years escaped me – well that was until I recently visited my good friend Louis, who lives in Spain. Lu is a country boy from Willowmore in the Easter Cape who moved to Castelion in Spain. On the first morning of my visit to him, he surprised me with a very simple Spanish breakfast… pan tumaca. Directly translated this is bread and tomato. Naturally, Louis in his usual flamboyant manner served this with a glass of Spanish red wine and the two of us celebrated with a toast to the good life and lasting friendships. Following my visit to the continent there was just no stopping me. These days, very few breakfasts in my house are served without a glass of good red wine! One of the better breakfasts to enjoy …along with a tipple is John Whaite’s Lebanese Lone Wolf Eggs. Lu, I am looking forward to your visit in December. I shall be making you a breakfast, open a a bottle of the finest red so that we can raise a glass to our friendship and your health! Fry the onions in oil for about 5 minutes in a small frying pan. Stirring occasionally, add the garlic, chilli, sumac, paprika, cumin and ground coriander. Stir well so that the spices coat the onions. Add the tomatoes and pomegranate molasses. Bring to the boil, then reduce to a simmer and allow the ingredients to gently bubble for about 5-10 minutes - or until the sauce is a good, thickish consistency. Stir in the thyme, fresh coriander, salt and pepper. Please taste and season the sauce. Crack in the eggs and allow the whites of the eggs to cook completely while keeping the yolks soft. In loving memory of Dorothy Bradfield. Every morning Mrs B would order anchovy toast which I would have to go and fetch for her. We then sat down with our cup of coffee, anchovy toast and cigarettes. To this day, I still have an affinity for anchovy toast and every time I see anchovy toast I remember Mrs B.
I did a bit of research and found the basis for this recipe in the Household of Cookery for South Africa (1941). I tweaked it a little bit and added some lemon, a pinch of cayenne pepper and parsley. Wherever you are Mrs B, I hope that you are smiling down on me and my anchovy toast – cheers to all the memories and good times shared. Put the anchovies and lemon juice in a pestle and mortar and pound till fine. Add the hard boiled egg yolk, butter and cayenne pepper and pound till fine. Spread mixture over hot toast and sprinkle with chopped parsley. Optional: You can chop the white of the egg finely and add that to the anchovy toast. Take just 3 eggs, a little seasoning and you can whisk up a flavourful + healthy + nutritious meal. Omelettes can fit into any occasion … you can make them for breakfast with a slice of toast … for lunch with a light salad or for supper with some chicken and cheese. There are a myriad of ways of making omelettes – and everyone has their own favourite way. Last Monday, four of us friends played around with eggs and omelettes: Errieda Du Toit aka Huiskok – cookbook author + radio host + foodie doyen to the masses introduced me to her fluffy, fairy tale “pof omelet”. My bachelor blogger friend, Fritz surprised all with an egg carbonara omelette – so beautifully laced with spaghetti – and celebrity Chef friend Nic van Wyk blew everyone away with his mushroom dust + truffle oil omelette. My egg dish for the evening was a sweetened pear omelette flambéed in our own award winning South African Brandy – recipe below. ENTER AND WIN: With a special thanks to the egg farmers across South Africa, lifeisazoobiscuit is giving away a beautiful, yellow hand blender. COMPETITION CLOSED. For more information on eggs visit www.worldeggday.com or www.sapoultry.co.za. 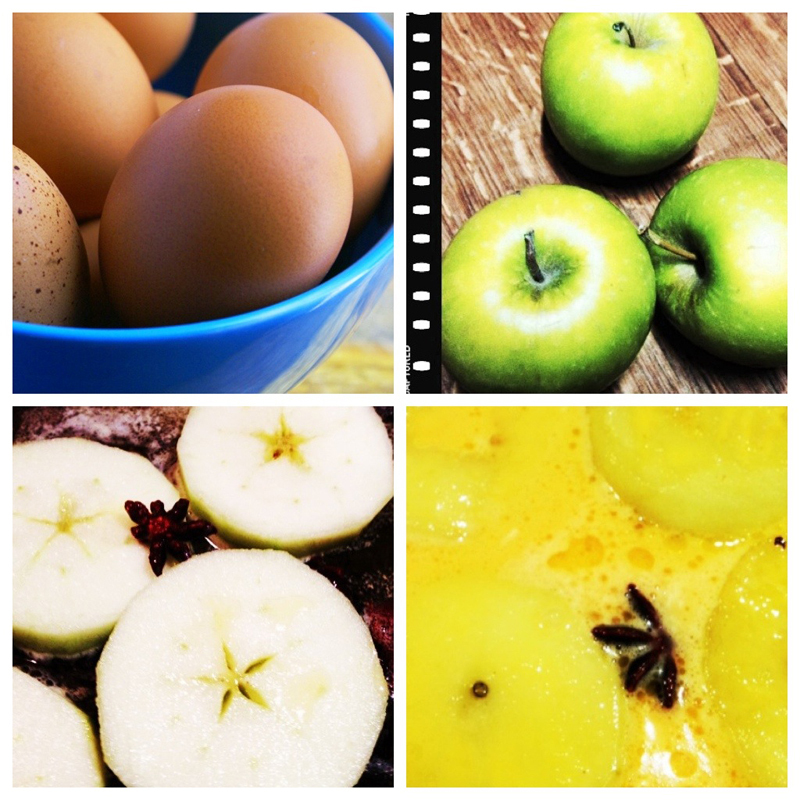 On medium heat in a large non-stick pan – melt the butter and add the Star Anise, cinnamon, pears and 3 Tbsp of sugar. Stir from time to time but be careful not to break the pears. Then pour the eggs over the pears. Cook until the eggs are set. Lift it on the sides to make sure it stays loose and that your egg mixture does not stick to the bottom of the pan. Invert the omelette by turning the pan over onto a large serving dish, sprinkle a tablespoon of sugar over the omelette and pour the 3 tablespoons of brandy over the dish. Carefully ignite or light the brandythen shake the platter until the alcohol burns off and extinguishes itself. Serve immediately. Tuck in and enjoy amongst friends. This recipe was inspired by a very interesting ingredient list I received from Pick n Pay for their freshlyblogged competition. See details below. When I saw the ingredients (see ingredient list and rules of this week’s challenge below) my mind went straight to Phuket – the delicious Asian cuisine and the warm sultry beaches. So for my main dish I decided to make an Asian frittata with Asian vegetables and noodles laced with subtle traces of garlic and coriander and serve it with a pineapple salsa. Frittata is Italian for omelette but this specific dish blends the very aromatic flavours of the East with the charismatic cooking methods of the Italians. 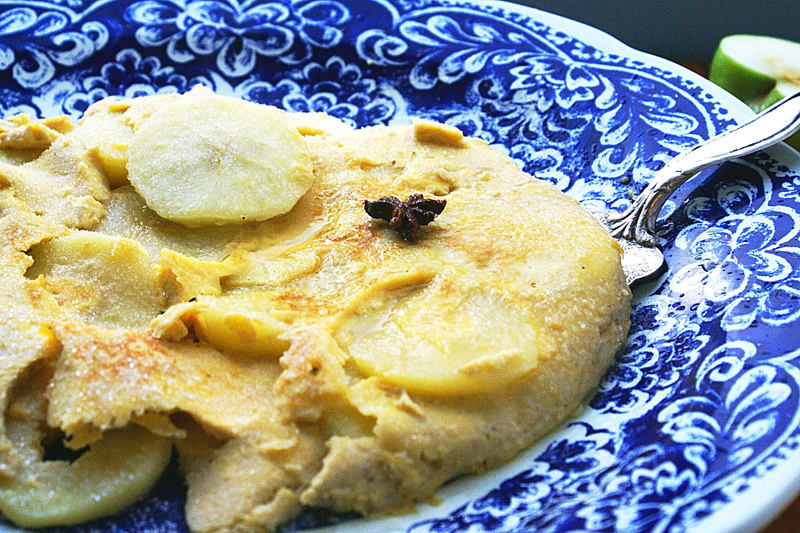 It is simple and timeless – you can have this for breakfast, lunch or supper. But I think what truly lifts this dish from the ordinary to something quite special is the addition of fresh mint to the frittata and salsa. My neighbour of many years, Poppy was married to an Italian and she taught me how to use mint in a whole variety of dishes – even roasted chicken! The pineapple was marinated in orange juice, ginger, orange zest and mint. The ginger gives a bit of heat to the dish and the mint binds the two dishes together into a marriage of fresh flavours. It’s absolutely delicious, filling and refreshing. You may omit one ingredient (except the Findus Wok Thai vegetables) from the above list. You may add one ingredient of your choice. The dish must be vegetarian. Frying pan size – 26 or 30 cm. If you don’t have the right size frying pan – divide your mixture in two and make two frittatas. If can use a non-stick frying pan. If you don’t have a non stick frying pan butter the sides of the pan as well. Frittata- Prepare the instant noodles as per packet instruction. Put it in a sieve to strain. Set aside. Heat the oil in a saucepan over high heat and add the frozen vegetables. Add the coriander and garlic paste to the vegetables and stir fry for 5-7 minutes. Add the fresh mint and season with salt and pepper. Set aside. Whisk the eggs in a bowl and add the salt, stir fried vegetables and the drained noodles. Mix well with spoon. Melt the butter in a frying pan. When it starts to foam add the egg mixture. Turn the heat to low and let it cook gently for 12 minutes. The top should still be slightly runny. Preheat a grill. Pop the frittata in for only a minute or two. It must just set. Put your palette knife underneath the frittata to free it from the pan. Slide onto warm plate and serve with the pineapple salsa. Salsa- Cut the pineapple in small blocks and add the orange juice, orange zest, ginger and fresh mint. Allow it to marinade for a few minutes. This one is quick + easy and been a firm family favourite through the years. I remember sitting around the kitchen table, the radio playing in the background (there was no TV in those days)… My dad saying grace and thereafter mom bringing in this big baking tray full of steaming mac + cheese. We did not have the fancy or posh mac and cheese – there was no bacon, no mushrooms, no cream etc … our mac and cheese came straight out of the Kook and Geniet and straight out of the oven. The basic ingredients are milk, eggs, macaroni and cheese. It’s the baked version that you can cut in blocks. We used to just get these blocks on our plates and in the middle of the table was a bottle of tomato sauce – and that was it for us … heaven. So today I took the same recipe my mom used and tweaked the ingredients to suit my adult taste buds. When it came to the tomato sauce I had to make a few changes – I fried some plump delicious rosa tomatoes in olive oil, added tomato sauce and fresh basil. Its still my mom’s mac + cheese + tomato sauce – with a little twist. Life seemed much more simpler then. At least I can say that this recipe has remained simple and easy … give it a go. Mix the milk, eggs, mustard powder, salt and pepper all together. Then add the cheese and cooked macaroni. Butter a baking dish well and add the mixture and bake for 1 hour. For tomato sauce: Heat the olive oil and fry tomatoes till the pan is quite dry. Add the water and cook again till quite dry.Then add the sugar + tomato sauce – heat through. Finally add the fresh basil + season to taste + serve with your mac + cheese. Here is something simple for you to try this Christmas – a TWO MINUTE stick blender mayonnaise. Most foodies know this fool proof method but I am surprised at how many people still use the old drop-for-drop-oil-method. The big secret behind this recipe is to add the ingredients in a narrow vessel/container in the right order… egg + oil – this is critical. Let the ingredients settle for a minute – then put your stick blender carefully on top of the egg yolk – the blender must touch the bottom of the container … then only then start blending until the mayonnaise starts emulsifying. S-L-O-W-L-Y pull the stick blender up to complete the emulsification process. Here is a video clip to show you how easy it is to make your very own homemade mayonnaise. Make a cupful or a bucketful, its fresh and fantastic. Its creamy and dreamy and perfect with just about anything…salads + potatoes + dips. Sending you love, blessings and best wishes from Dublin, Ireland. May you have an enchanting, carefree and fabulous Christmas. In this specific order - place the egg yolk in a tall container or jug, then add the oil. Place your stick blender right on top of the egg at the bottom of the jug and start blending until the mayonnaise starts emulsifying. SLOWLY pull the stick blender up to complete the emulsification process. A man and his wife owned a very special goose. Every day the goose would lay a golden egg, which made the couple very rich. But now let’s get back to recipe….the sun was out and spring was in the air…what was I going to do with these gorgeous goose eggs? 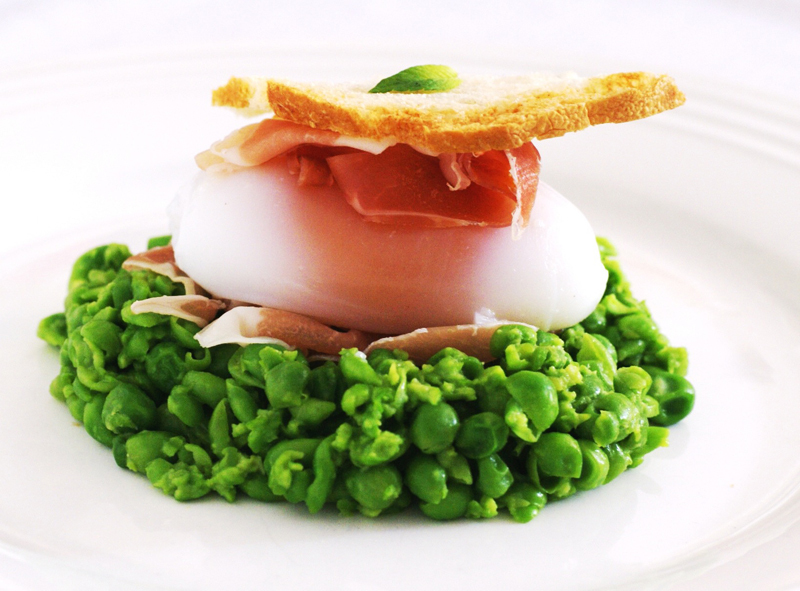 I went to Sat Bains for inspiration – he was the one who took the classic egg, ham and pea combination to a whole new level by using the sous vide method to cook duck eggs and to serve them with a pea sorbet. I was determined to sous vide these two golden beauties and serve them on a nest of crushed minted peas and prosciutto with some little toasts. I do not have one of those fancy and very expensive sous vide water baths and I could not find a recipe … so I had to improvise. With a pot of hot water covering my eggs – it took me 2.5 hours at 62°C – sitting by my stove with an electronic thermometer in hand to ensure that the water temperature remained constant. I added cold water when the temperature went up. It took some time and some doing but it was worth every single minute. The thick golden yellow yolk that oozed out of this perfectly boiled eggs was like liquid gold …and something you just have to try once in your life. 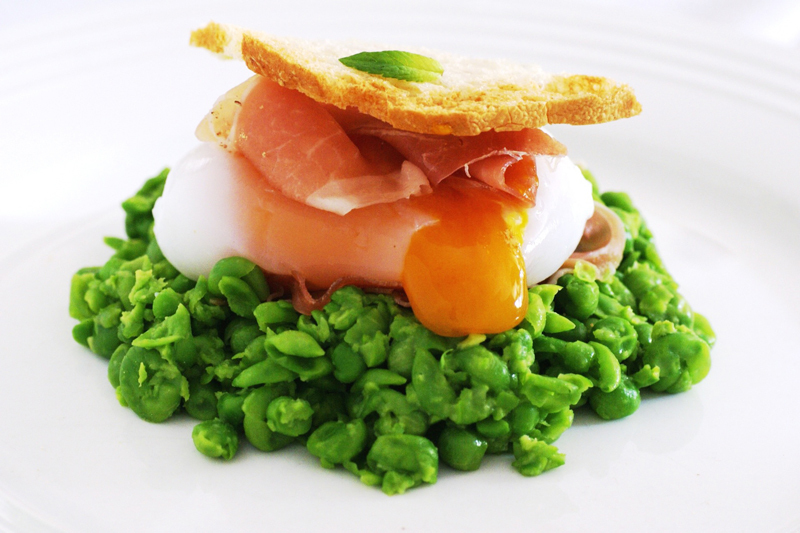 The perfect combination of the sweet peas and then the salty prosciutto and a scoop of the golden yolk on a crispy cut of toast are just absolutely from another planet. Of course, the dish was not complete without a sprinkle of salt and freshly grounded white pepper. Thank you Nina and thank you Mrs Goose for bringing some rays of golden sunshine to my plate. For the goose eggs – heat the pot with water to 62°C and then add the eggs. Keep it on the lowest heat level on your stove and try and keep the temperature constant for 2.5 hours. You just have to stand by the stove, check the thermometer and add a bit of cold water to bring the temperature down. When done, put the eggs aside to cool a bit. Then peel very carefully. The shell is very hard and thick and it’s not so easy. The outside of the white is going to fall away and you will sit with this beautiful thin white layer and the golden yolk. For the peas – cook the peas for about 3 minutes. Add the salt, butter, mint and sugar give it a good stir and then crush. 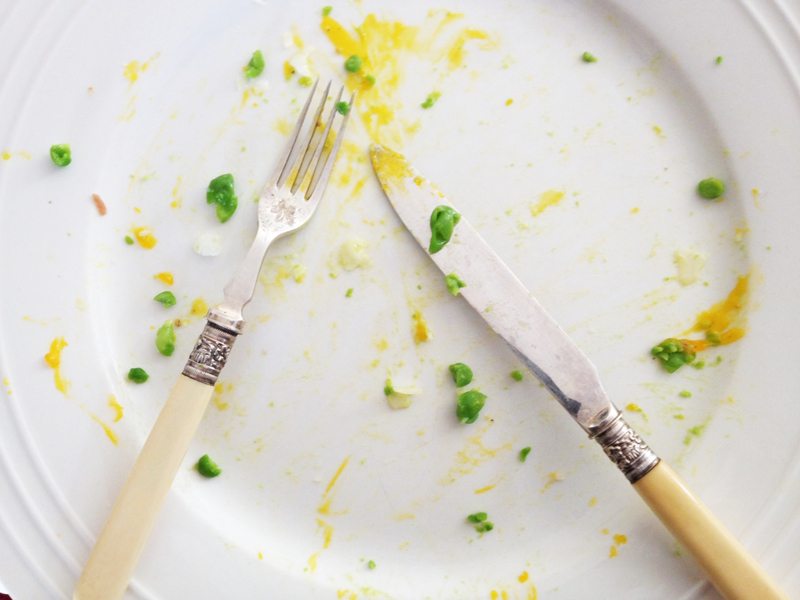 To assemble - divide the peas in half and divide onto two plates. 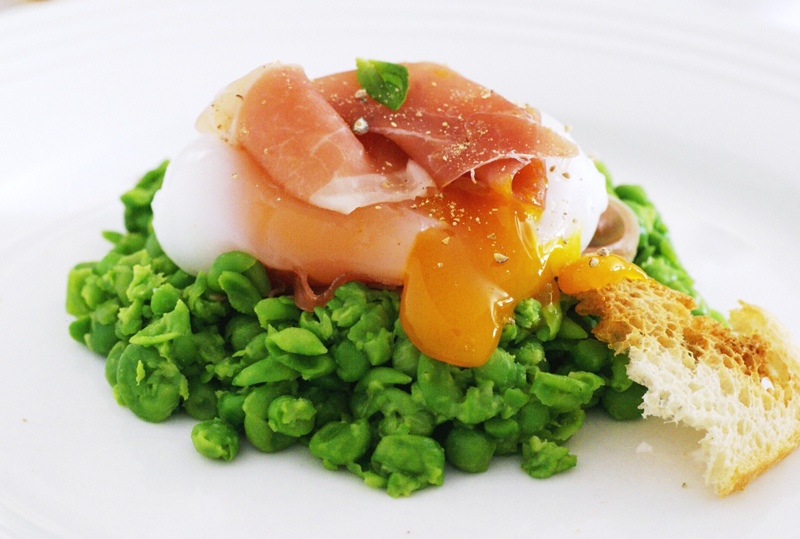 Add a slice of prosciutto on each nest and then add the egg. Sprinkle with white pepper and some salt - then add another slice of prosciutto and round it off with a little toast. My favourite Saturday morning breakfast is a soft poached egg on whole wheat toast with a bit of wild rocket out of my garden and a pinch of Maldon salt. 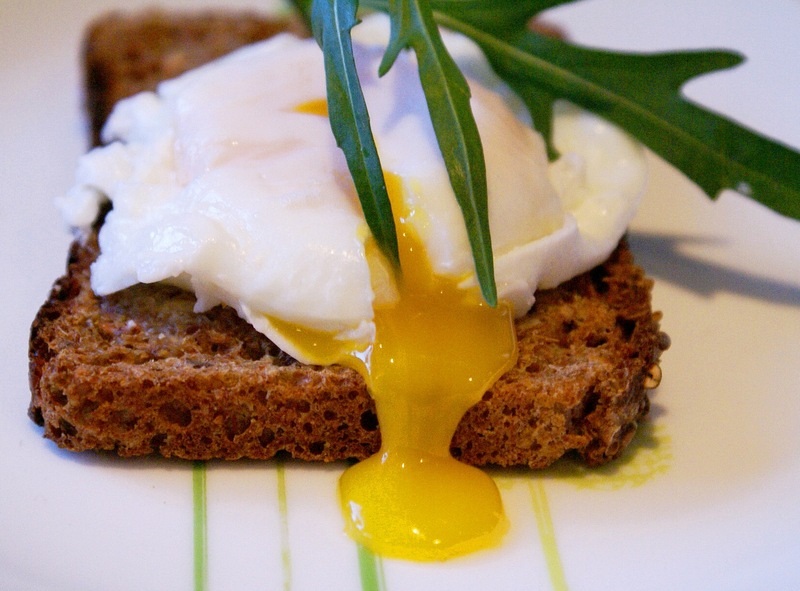 When you cut into that egg and the yellow slowly ooze onto the bread … it is like early morning sunshine on my plate! What I want to share with you today is not a specific recipe on how to poach the perfect egg but a few interesting facts and tips that might help you along the way. I am sure you will know most of them but one or two of these pointers are quite interesting. 1. The fresher the egg, the easier the poach – fresh eggs hold together better when slipped into the simmering water. 2. To test to see whether an egg is fresh – put the egg into a bowl of water. A very fresh egg will immediately sink to the bottom and lie flat on its side – an old egg will float. 3. The eggs must preferably be room temperature. 4. Remember to add a bit of vinegar to the simmering water – it helps hold the egg together. 5. The water must be simmering not boiling. 6. Now, my best tip is to slowly submerse the whole egg with shell and all in the hot simmering water for 10 seconds before you break it. This ensures the whites on the outside of the egg hold together better during poaching. 7. Before breaking the egg into your simmering pot of water, use a spoon and give the water a stir so that it forms a little bit of a whirlpool…the centrifugal motion will pull the egg together when you slide it into the water. 8. When you break the egg break it into a saucer or cup first – be careful not to break the yolk and then simply slide the egg off the saucer or cup into the centre of the whirling water. 9. How long to poach the egg? Here’s a quirky snippet I read…when you put your bread in to toast put your egg in to poach…when your toast pops out of the toaster…your poached egg should be ready to be removed from the pot. Otherwise poach it for 3-5 minutes until cooked. 10. When done scoop out with slotted spoon or spatula onto a paper towel to dry excess water from the now poached egg. 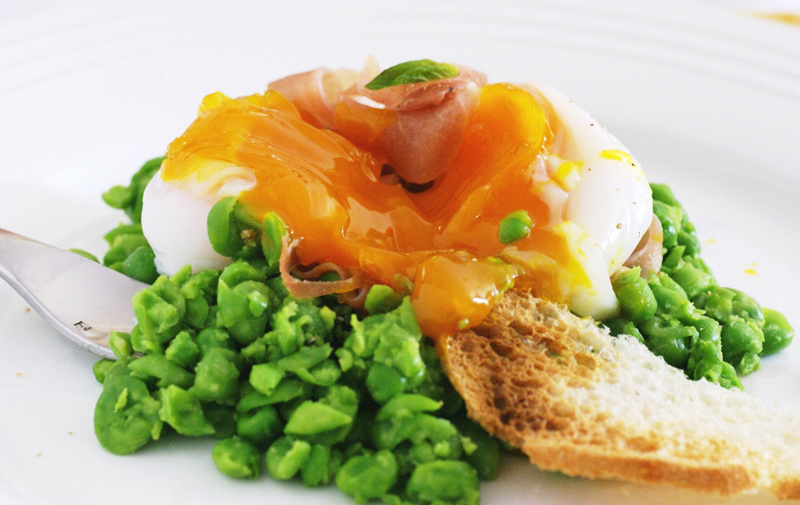 It’s quick but fabulous when poached to perfection… decadent and yummy all at the same time! Don’t forget too that a poached egg on top of a rocket + bacon salad makes for a wonderful salad option just ever so slightly out of the ordinary.